Old pear trees bear few fruit, and the pears that do survive are often poor tasting. 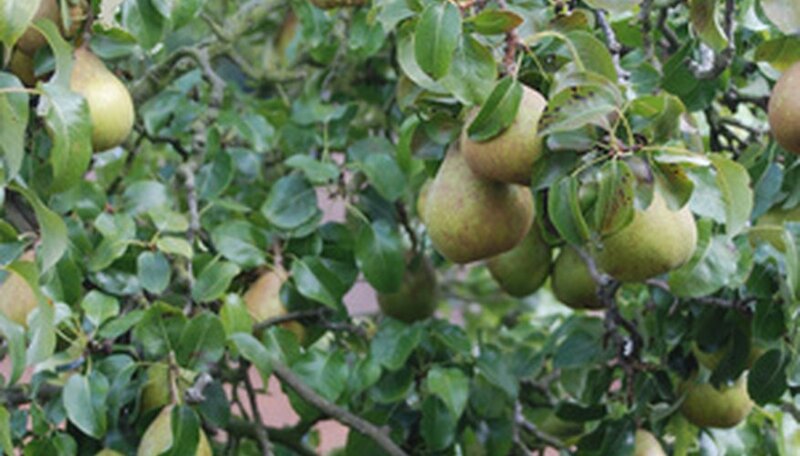 Rejuvenating your old pear tree not only shapes it, but improves the quantity and quality of pears. Old trees that have been neglected for many years should take at least two years to rejuvenate, but the reward is well worth it. Use your improved pears to make pies, pear butter and pear salad. Prune each year in the later winter to early spring. Find dead, diseased and damaged branches on your pear tree--these are the first to go, since they can sicken the tree. Diseased or damaged branches can be discolored, deformed, wounded or bear growths. They are notably different from healthy wood. Dead wood feels hollow and does not move in the wind. Prepare a disinfectant solution by mixing one part bleach to 10 parts water in a bucket. Place pruning tools in this solution. Remove the dead, diseased and unhealthy wood by cutting it off at the base. After every cut, dip your tools in the disinfectant solution. This guards against the spread of disease through your old pear tree. Remove branches that rub or crisscross other branches, since this puts stress on the wood. Clip off suckers that grow from past pruning cuts or off the pear tree's trunk. Doing this gives the pear tree lots of energy, as suckers drain its resources and will never bear fruit. Remove up to one-third of the old growth. Choose old limbs that do not bear fruit or that cast shade on branches below. No matter how neglected your pear tree is, removing more than one-third of the wood will create more of a mess by causing excessive new growth. Wait one year. Then remove up to one-third of the old growth again to restore the neglected old pear tree to good health. As before, remove dead or damaged wood and suckers. Use lopping shears for cuts thicker than 1 inch and hand saws for large limbs that you cannot cut with loppers.